Whether you’re replacing an existing boiler or installing a new Forced Hot Water (FHW) Heating System, the procedure is the same. A plumbing/heating guy moves in with a service truck full of parts and tools, a supply house truck arrives and drops the boiler and sundry parts. Then the game begins ….. The old boiler (where applicable) is removed by whatever means required, the ensuing mess is cleaned up, and the new boiler is moved into the area. 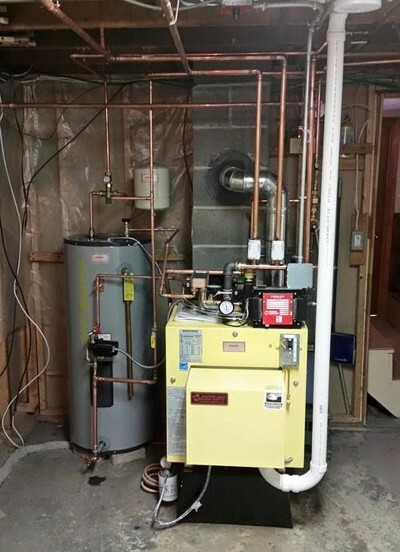 Locating and positioning the boiler is the first task and directly determines the effectiveness of the entire installation. The preferences, methods, materials and the heuristic judgement of the installer prevails. Thenceforth the building of the “Erector Set” continues, pipe by pipe, wire by wire, device by device until the task is finally completed. It’s a slow, costly and inefficient process …..
All tradesmen develop their own methodologies, reflecting their pride and workmanship in the resultant. Unfortunately the customer pays a premium for this both initially and throughout the lifetime of his system ….. knowingly or not! We cynically refer to boiler installations as “The Plumber’s Playground”, that last vestige of “free expression” removing us from the daily tedium of “fixing leaks and squeaks”. Installing or replacing a boiler should be no different than a dishwasher or a water softener, with a few more pipes and wires attached ….. and it can be! Problem is we plumbing/heating guys (ourselves included) continually lag technology. We “Old Dogs have to learn New Tricks”, and brother we have! Recent technology now allows us to configure a FHW (Hydronic) Heating System as a true appliance! All heating system functions excepting radiation can now be integrated into a “packaged unit”, engineering it for peak performance and value in the process. “Delta-T” (Differential Temperature) Circulation Technology is truly an evolutionary and revolutionary improvement. Developed in the “high-tech” process world, it has now become both practical and economical as applied to Residential Hydronics (FHW Heating). Mercier Engineering via its website www.BoilersOnDemand.com is the introductory leader of Residential Delta-T Hydronic Heating. The question is not if Delta-T Circulation will out-distance conventional Fixed-Speed Circulation, but when. Evidence the following Pictorials and Details for comparison. Estimated service lives are from our and our collaborating serviceman’s actual field experience. Fuel & Electrical Energy Performance per Taco, Inc. published testing data. Arguably a high-mass (heavy) “Delta-T” System will outlast two (2) Conventional FHW Systems with a higher Hydronic Total System Efficiency at 1/3 the “life-cycle” cost. So when your potential FHW Heating System Installer comes calling, ask him first about “Delta-T” Circulation. If it draws a blank stare, send him home to call Taco, Inc. — and that another “Old Dog” told you to do so. After all, you the customers are deserving of all the “New Tricks”!